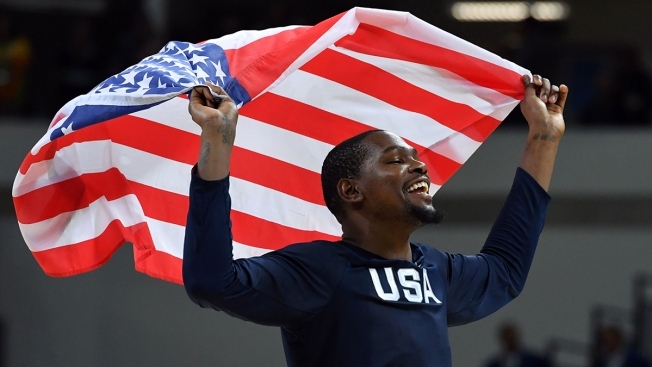 USA's guard Kevin Durant celebrates with USA's flag after defeating Serbia during a Men's Gold medal basketball match between Serbia and USA at the Carioca Arena 1 in Rio de Janeiro on Aug. 21, 2016, during the Rio 2016 Olympic Games. The U.S. Olympic men's basketball team won its third straight gold medal and did it easily, beating Serbia 96-66 on Sunday. After a few close calls earlier in the tournament, this was no contest. Kevin Durant scored 30 points and helped the Americans jump out to a huge lead by halftime. It was the final game with the national team for Mike Krzyzewski, who took the Americans back to the top and leaves with them there after becoming the first coach to win three Olympic gold medals. Carmelo Anthony also picked up his third gold to go with a bronze, becoming the most decorated male in Olympic basketball history. The U.S. beat Serbia by just 94-91 in pool play, holding on when Bogdan Bogdanovic missed a 3-pointer at buzzer. This rematch looked nothing like that meeting, but it did resemble the final of the 2014 Basketball World Cup, which the Americans won 129-92. DeAndre Jordan went to the stands at Carioca Arena and collected an American flag, which he initially wrapped himself in like a blanket before holding it high over his head for all to see. After a slow start in Rio, there was no doubt about who was on top, and the Americans beamed as they walked off the floor before the medal ceremony where they will again be center court. That wasn't a sure thing earlier in the tournament, when the U.S. had consecutive three-point victories. The 10 Olympic newcomers seemed to be jelling slowly and the U.S. came in winning by just 21.4 points per game, more than 10 per game fewer than four years ago and about half the 43.8 the Dream Team won by in 1992. Krzyzewski, an assistant on that team at the Barcelona Games, has long insisted that international basketball has gotten too strong for anyone to win that easily again.